Instapundit has linked to a blog misleadingly titled, the Captain's Journal, concerning the military's Rules of Engagement in the Iraqi theater. There are several myths being perpetuated, with faulty analyses that combine to sow discontent among the people of this nation and even people in the military. Sergeants and lance corporals surf the internet and hear of these so-called problems and conclude that the ROE are problematic. I want to address these fallacies in a reasoned way from the perspective of someone who has been there and knows what the ROE were one year ago. 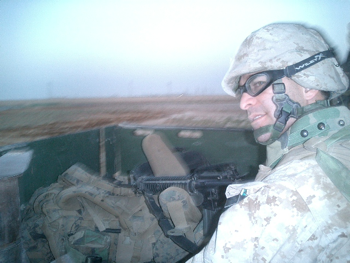 Although I don't think you need to have been over there to understand the issues, I will state that I am a combat veteran of the Hit-Haditha corridor in Al Anbar Province, Iraq from February to October 2005. I served with the Third Battalion, 25th Marines as the communications officer. Although I make no claim to being a war hero, I was in all the battalion level operations and was on the roads frequently. There are many, many who did a lot more than me, but I was there and I'm very familiar with the subject. First, I'll list the fallacies. Fallacy #1. The ROE are radically different than in past wars. Fallacy #2. The ROE are too restrictive and put our soldiers, sailors, airmen, and Marines in danger. Fallacy #3. The ROE are too complicated. Fallacy #4. If we change the ROE our troops will be able to act without fear of harrassment. Fallacy #5. If we change the ROE we will win the war. All of these are fallacies, but the first point to make is that the ROE are made by people who are in theater, who see and do the actions defined in the rules, and who have a grave sense of responsibility to the people entrusted to obey these rules. The purpose of the ROE is to ensure that the coalition forces accomplish their mission, and to ensure that force is employed consistent with our war aims and the need to safeguard innocents. Fallacy #1. The ROE are radically different than in past wars. Militaries always have rules of engagement. They may not use the term, they may not even write them down, but they are necessary. The ROE for the USMC on Tarawa were essentially, kill everyone who is not on our side. The ROE for the US Army in France and the Netherlands were probably essentially the same as what we see now in Iraq. France, especially is a good analogy. In that case the insurgency was on our side, but otherwise the problems of safeguarding the civilian population while rooting out Germans and the very prevalent pro-German French was complex. Go watch old re-runs of Vic Morrow and Rick Jason in the television series "Combat!" and you'll often see cordon and searches very similar to what the Marines are doing in Al Anbar. The enemy in Al Anbar is nowhere near as well-trained or competent as the Wehrmacht but the ROE requirements are largely the same. I know it's a stretch to use a tv show to make a point, but the ideas are valid. The basic idea is that whenever you have a whole lot of people running around with loaded weapons in a place where people are shooting at you, you need to have rules to control that violence that you need to inflict or else there will be chaos. Fallacy #2. The ROE are too restrictive and put our soldiers, sailors, airmen, and Marines in danger. People making this argument are generally ignorant of the content of the ROE. This is because the ROE are classified. No one without a security clearance should have seen what the full ROE are. In addition, the ROE change per circumstance and location. Much has been made of a news article claiming that "new" proposals to the ROE now put unit safety above individual safety, and that commanders can locally limit the use of force in self-defense. I am in no way confirming or denying these claims, both because I wouldn't do so because the ROE are usually classified, and also because I am not privy to these supposed changes. But that being said, we can still make an analysis of the claims. Unit safety is always first before individual safety. This is always the case in any military unit. If individual safety came first, our military would not be able to do anything because we'd be hiding in big holes in the ground afraid to venture forth to accomplish any mission whatsoever. Commanders always have the authority to order men to do things that may get them killed, indeed they have the authority to order men to do things that will almost certainly get them killed. There is nothing new to this. The second point that some units may be allowed to limit the use of self-defense is also nothing new. I can envision two scenarios where this may be necessary. First, as someone else pointed out, when you deploy outposts forward of the main defensive positions, the people in the outposts typically are told not to shoot and to get back to the lines if they see trouble. The second point is that many areas of Iraq, notably the green zone and the Kurdish north are, by report, largely safe. I've never been to those areas so I don't have first hand knowlege of this. But let's assume that this is true or will be true in the near future. This caveat in the ROE allows commanders to limit the use of force among a population that is largely peaceful. Just like in downtown Austin, Texas we don't allow the military to shoot people, so in peaceful areas of Iraq or other places in the area of operations of Central Command commanders should have the latitude to limit the use of force. I would not expect any commander in Al Anbar Province to adopt this policy. It is optional and situationally dependent. Fallacy #3. The ROE are too complicated. It is true that the ROE are complex. They are written by lawyers and they are very long, I vaguely recall at least 50 pages, probably a lot longer. When I pointed this out to some people as evidence that most people can't argue the merits of the ROE since they haven't seen them, many people jumped to the conclusion that the rules are too complex and unwieldly to expect anyone, especially Private Smith from small town, USA to understand. The best illustration of the incorrectness of that conclusion is to compare the ROE to the rules of a sport. The rule book for the NFL is in the range of 200 pages, and I don't have the time nor the inclination to count the pages in the Major League Baseball rulebook. The important point is that I don't know all those rules by heart, I probably don't even know a tenth of those rules. But that doesn't stop me or anyone else from playing football or baseball competently. If I'm a left guard, all I really need to know is that I keep still until the ball is snapped, I stop the guys in the other colored shirts from getting past me, and I can't hold the guy or hit him from behind when I do that. I should know some more rules about fumbles and interceptions, but that's about it. I don't need to know about roughing the kicker or the passer. I don't need to know about touchbacks, or illegal pass protection. In baseball, all I really need to know is to hit the ball when I'm at bat, and I have to do that without exceeding three strikes, and a few other rules about fouls, and the batting box. There's lots more out there, but that suffices for most people. On defense, the most complicated rule is the infield fly rule, but otherwise those volumes of rules are uninteresting and unnecessary for me. The same is true for the ROE. If you're in a mobile assault platoon, you need to know the rules for setting up a snap vehicle checkpoint, and convoy protection for most days. If you're part of an overwatch of an area, you need to know a few simple rules about what constitutes behavior that marks someone as an enemy combatant, and that's about it. These summaries are often put on small cards that easily fit in a breast pocket. Anyone who can understand the infield fly rule can handle any of these ROE quite easily. The same is true for other jobs in the area of operations. Pilots have their rules. Battalion commanders have much more rules. Just as coaches and umpires need to understand more of the rules than the left guard, so commanders have to know more about the rules that they must follow when employing the forces at their disposal. Fallacy #4. If we change the ROE our troops will be able to act without fear of harrassment. This is probably the real crux of the issue that people have with the ROE. Whenever someone gets killed by our forces and the circumstances warrant an investigation, people naturally become fearful that the investigation will go badly for them and they can get in trouble. Trouble from violating the ROE can be in the form of a formal or informal counseling, up to jail time, or even execution. Knowing that there can be very serious consequences naturally makes people apprehensive. But if you examine the record, no one I am aware of has been prosecuted or convicted of violating the ROE except in very extreme cases where the individuals lost contact with the idea of being a human being, let alone an American, and commited atrocious acts. Even the massacre at Haditha is still pending prosecution, but I expect that it will progress in that direction. In all other instances, the military has acted consistent with the intent that actions taken that are reasonable to the situation aren't punished. These are very liberal ROE when viewed in this light. But what if we did decide that somehow the ROE were too restrictive, and that there is some way to make them more liberal? What would change? The CNN factor would be exactly the same. That is, we know that Marines are able to defend themselves if they think they or their unit is in danger unless someone makes special exceptions for the situation. We have seen that a Marine in Fallujah can kill a man lying wounded in a Mosque. The ROE supported his decision to kill that wounded man because he had a reasonable concern that the wounded man was an enemy with a grenade and was preparing to use it on him and his comrades. 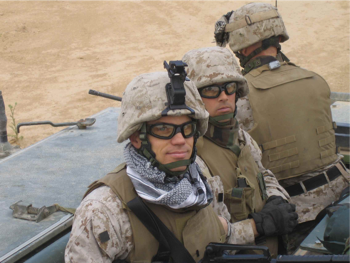 That Marine made the right decision and the ROE and a team of lawyers supported his decision. Now let's say that the ROE are changed so that it is even clearer that he can do what he did. I'm not sure how it could be clearer, but let's say that there is some spectrum past "allowed to shoot people when they are suspected of holding a grenade" that we can somehow attain. What would happen now? What would happen is that if a cameraman is there and films the Marine shooting the wounded man in the Mosque, that even though he is justified and even more allowed to do what he does, the press will still be likely to put this incident in the press, either because they support the enemy, or hate the war, or just because they think the issue will increase viewer numbers. They might even have good intentions combined with a quioxtic interest in publishing "truth," which seemed to be the case in the real story. When that happens, it again will not matter that the Marine is correct in his actions, what will matter is that hometown USA will see someone writhing in pain on the floor of a Mosque getting killed. The pity factor will cause many to recoil, and a big national debate can ensue. Thus, to protect the Marine, the commander has to do a credible investigation. The investigation will find that our fictitious new even more tolerant ROE allowed the killing and nothing changes. You'd still have a Marine afraid of a very serious investigation, and others will take that in and be likewise affected. My point is that the ROE are more than adequate, it's not the ROE that are the problem. The problem that most people complaining about the ROE perceive is the reaction in the press that causes investigations. These reactions have little to do with the ROE. Fallacy #5. If we change the ROE we will win the war. Changing the ROE will not allow a torrent of military actions that will end the war. Some people are under the impression that changing the ROE will allow us to kill more of the enemy. The truth is not that clear. With our pathetic troop levels, it's very easy for the enemy to act with relative ease in almost any location. For example, my battalion used two line companies and a weapons company (about 500 Marines) to cover more than a hundred miles of the Euphrates River along the well populated Hit-Haditha corridor. The best we could do most of the time we were there was play whack-a-mole with the insurgents. Later we got our third company returned to us from defending the local air station and as we left to go home an army battalion took control from us of Hit while our replacements took Haditha. Each was augmented by one or more of the new Iraqi Army battalions. After we left to go back to the United States the area was largely pacified by them to a certain extent. This is pretty positive evidence that doubling the troops in an area has a significant effect on enemy activity. Without an increase in troop strength we cannot have the ability to find the enemy in enough quantity to stop them, and we don't have the ability to stay and convince the locals that they are safe. We already have authority from the ROE to kill or capture the enemy when we find them, it's the finding part that is hardest. More permissive ROE will not serve to help us be more places at more times to see enemy preparations and actions. 1. Gunnery Sergeant Fifer, Communications Chief, Sergeant Arnold, Radio Watch Supervisor, Staff Sergeant Kozar, Radio Chief preparing to go on an ad hoc foot patrol looking for an enemy mortar team. 2. 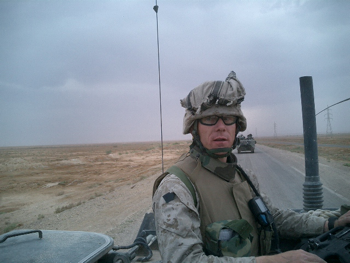 Gunnery Sergeant McIntire, Battalion Gunner, riding in the command and control amtrac on the way into Operation New Market. 3. 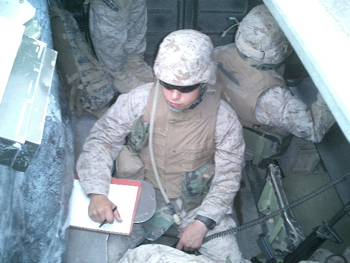 Lance Corporal Rasic, Data Technician, serving as a radio operator in the command and control amtrac for operations in Kubaysa. 4. 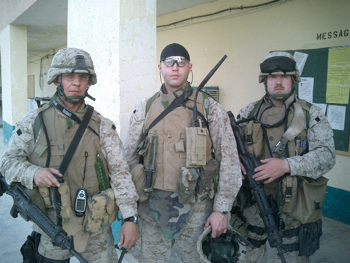 First Lieutenant Lobb, Assistant Intelligence Officer, and Major Rentner, Communications Officer in the command and control amtrac riding into Haqlaniyah. 5. Major St. Romain, Intelligence Officer, leaving Hit after Operation Sword. It's not my fault. My seventh and eighth grades were in a school that combined grades seven through twelve. The school was small enough that the PE class included those from all grades. In seventh grade I was well under 100 pounds, well under five feet tall. It's not my fault, that's just the luck of the draw. But I had to play football and other sports with men who were over six foot, and who knows how much they weighed. The big problem is that those men weren't really men, they still had the minds of boys, and not always as civilized as one could hope, especially if you're the tiniest person in the class hoping that they remain civilized that day. I was smart enough not to get into a lot of fights, and usually the biggest guys didn't give me the time of day, but there were exceptions. I learned, kind of by accident, a fairly effective method of countering a guy who was much, much bigger than me. If the guy started to grapple with me, I had a few options. I could run away, provoking a desire for him to do it again in the future, or I could confront him. Confronting him in the traditional sense was no good. The old line about bullies being afraid you'll fight back is bunk. They're not usually afraid if they outweigh you by more than twice your own body weight, and it is virtually impossible to hurt them in the accepted manner of punching them, particularly if you can't even reach their nose! I found only one way that kind of worked, and I tried it out of sheer desperation. When a guy started messing with me and I couldn't avoid his harrassment, I would close with him instead of running away. Normally, this is not a good strategy, but stand-off weapons aren't allowed in school, and I had few other choices. Punching didn't hurt him, I was too small. My only thought was that if I poked his eyes, then that would hurt, but I had to get to his eyes first. And that's how I discovered my new strategy. I jumped up while he tried to wrestle me and climbed up on his shoulders. I got as high up on his body as I could, and tried my best to unbalance him. I learned that seventy pounds on the head of a 180 pound boy is often more than they can handle -- especially when that seventy pounds is trying as hard as he can to claw at him, choke him, and throw him off balance. Once I got him off his feet, his bullying buddies laughed and guffawed at him, and I went on my way, unmolested any further for at least that day. I was only able to use this strategy a few times, but it was usually pretty effective. There is one situation where it does not work. It only works if the other guy doesn't really mean to permanently hurt me. If he really intended to hurt me badly, then this strategy was disastrous. Rather than recoil in shock and retreat, a truly intentional antagonist would simply be more ruthless, and if I had closed to within arm's reach, he could inflict a lot more pain than I could. The tired old political realists that helped prolong our cold war with the USSR have been pulled out of retirement. They're nice guys, I'm sure, and they are watching as Iran, the puny 70 pound scrappers, climb up on the loftier ideologies of our powerful nation and are clawing and choking us. Unlike my gym class bullies, this time the bigger guy is the good guy. There are two choices for us, the Good Goliaths. We can get ruthless with our antagonists, or we can recoil in shock and retreat. The Fabulous Baker Boys are recommending retreat even though we have disproportionate power in every way, morally, economically, militarily, and politically. Rather than countering their desperate move with effective violence, they would have us shamefully stop fighting in earnest. Iran declared war on us in 1979. They are provoking us continuously. When we initially invaded Iraq, they were horrified. Almost four years later, they've learned that we're not serious. They are taking advantage of our lack of resolve, throwing us off balance, tying down our military in Iraq, knowing we lack the will to take steps sufficient to stop them. While our tacticians in Iraq spout doctrine about OODA loops and COIN, Iran is creating fear and horror among Iraqis that is more comparable to 1930's Spain than it is popularly thought to be like Viet Nam. Iran has us doing OODA loops, and we are very effective at turning tighter, reacting quicker than the enemy. The Rumsfeldian method of fighting war on the cheap with light forces isn't working. But unless we do something to stop the source of the enemy's power, Iran and its theocracy, our OODA loops look less like brilliant tight turns and more like spinning in place. 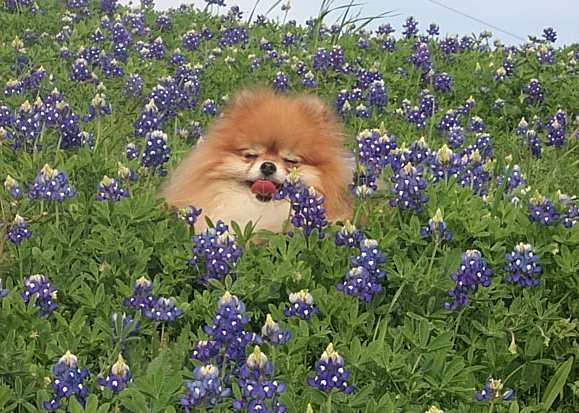 Iran is making our generals look like circus dogs, like little Pomeranians spinning in tight circles, with a happy grin on their faces while the Persian Lion has gotten loose and is eating the lion tamer. We need to put our lap dogs back in their hutches, and let loose the dogs of war, mastiffs and pit bulls, and throw Iran off our shoulders and hurt them. Dogs don't know what a fee simple determinable subject to shifting executory limitation is. I wonder if we are better or worse off for knowing. Okay, I'm studying for final exams and I have a few general comments about academia. 1. Some academicians seem to have a strange idea that it's not their responsibility to teach. These professors seem to take a perverse pride in not teaching the subject matter, instead they think that good students will learn on their own, and that only poor students require teaching. They couch this attitude in comments like "we want you to think, not regurgitate" and other nonsensical platitudes. This fosters laziness on their part. This is not a law school phenomenon, it is true at all universities, in all fields I have seen. 1.a. The goal of higher education is not to educate, it is to foster the reputation of the university. Universities gain reputation by having their graduates succeed, make money, and contribute back to the school. Contributions include money, but also political and academic actions. Whether students learn is incidental. In contrast, classes I've taken in private industry or even in the Marine Corps have been as complicated, but the emphasis was on every student learning all the material rather than on creating a curve of performance. Instructors in those schools are not interested in grading curves, they are concerned only that the student knows all the material. In academia, the fact that students know material is incidental to the purpose, it is the student's responsibility to somehow get the education despite the institution's lack of structure in teaching. 2. Law school is about ten times easier than my undergraduate mechanical engineering studies. I'm not saying that this means that I'm going to get A's. Performance is not necessarily a result of ease of the material, but the subject matter is not even close to being as complex. Law school professors seem to think it is the most complicated reasoning mankind can know. I don't think any of them ever studied differential equations or fluid dynamics. 3. Law school professors take great pride in claiming that their subject matter is very complex and takes a lot of deep thought. In reality, "deep thought" is their way of saying that the law is based mostly on whims masquerading as legal fictions, and the purpose of law school is not so much to teach the law, but to teach the lore and history of past whims. This allows lawyers to use the whim of choice in their legal arguments for their clients, in the hope that the particular judges that hear the case will use the whims that support their cause. 4. First year law courses are mostly a matter of rote memorization of hundreds of rules. If you know the rules, you can raise the arguments in your essay questions. Just don't tell the professors that this is the case, it will hurt their feelings! 5. Most of my professors in law school have been nothing short of brilliant, despite the hackneyed system that they have inherited from our academic culture.